Patch panel 19" fastening kit, labeling field, accepting the snap-in type color coding clips in 8 colors. 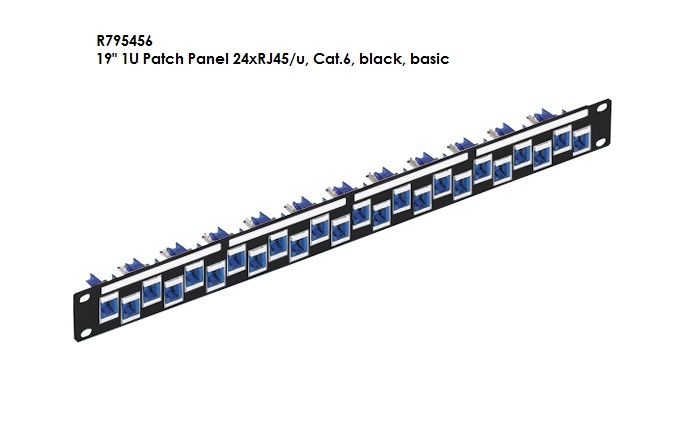 Populated with 24 unshielded RJ45 connection modules of Cat.6, for the setting up of transmission channels of Class EA with up to 4 plugged connections acc. to ISO/IEC 11801 ed. 2.2, June 2011, EN 50173-1 May 2011 (DIN EN 50173-1) and Class F on 2 pairs, complies with Cat.6A requirements of the standards ISO/IEC 11801 ed. 2.2, June 2011, EN 50173-1 May 2011, as well as ANSI/TIA/EIA 568-C.2, re-embedded tested in acc. with IEC 60603-7-41 and 60512-27-100, interoperable and backwards compatible with Category 6 and Category 5e. Suitable for 10GBase-T applications in acc. with IEEE 802.3an up to 500 MHz and 100 m.
Compatible with RJ standard plugs (RJ11, RJ12, RJ45), connection with automatic wire cutting of installation cables AWG 26 – 22 (0.4 mm – 0.65 mm) and flexible cables AWG 26/7 – AWG 22/7 without special tools. X-Separator for individual pair shielding. Parallel pair termination without crossover in acc. with EIA/TIA 568-A/B, gold-plated bronze contacts for >1000 mating cycles, IDC contacts with >20 insertion cycles, contact resistance <5 mOhm, dielectric strength >1000 Veff. PoE/PoEplus capable, 90° wire orientation without bending cable. With integral cable strain relief, including dust cover. Connection module Cat.6, unshielded, with dust cover, snap-in frame, cable tie and installation instructions.